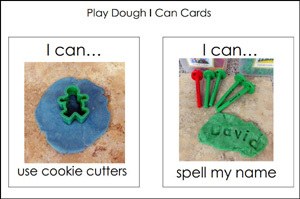 I created a set of printable “I Can” cards that will help your students stay on task in the play dough center. Don’t get me wrong, I’m not out to stifle creativity, but in the beginning of the year the play dough center can be a free for all if you’re not careful. 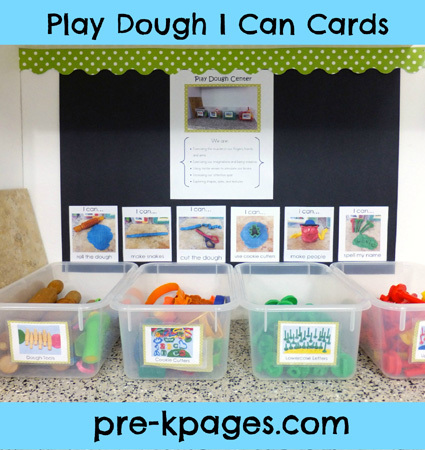 These cards can be especially helpful if your students have not had any prior experience with play dough or if you need to provide evidence that early learning standards are being supported in the play dough center. 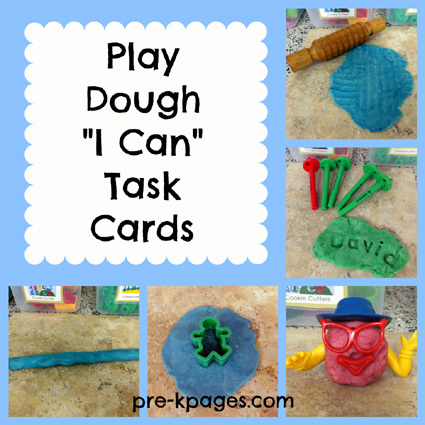 Each card has a picture of a task along with the words “I can…” Students can look at the pictures as a reminder of the different ways to use the dough. I printed each card, cut it out, and glued it to a piece of poster board in the play dough center underneath the play dough center sign. I also included a blank set in case you want to add your own pictures. Make Snakes: Develop fine motor skills and palmar arch in hand. Skills necessary for holding a pencil. Cut Dough: Develop fine motor skills in hand. The dough provides a thick, stable medium which makes cutting easier and provides children with successful opportunities to practice cutting with scissors. In case you’re wondering where I got the people pieces, they were part of a play dough set I found several years ago at a teacher store. I don’t think they sell them anymore, but you could easily use Mr. Potato Head pieces instead of this particular set. My favorite sources for inexpensive Mr. Potato Heads are garage sales or thrift stores. Find more play dough ideas and activities HERE. Follow my Play Dough board on Pinterest for more recipes and great ideas! Love the “I Can Cards” with the real photos. Amazing how something as simple as giving suggestions of “I can” helps with center management. You have so many great playdough resources! Thank so much for generously sharing your Play Dough “I Can” Task Cards. I featured your printable as the Free Printable of the Day at the Living Montessori Now Facebook page: http://www.facebook.com/LivingMontessoriNow. Glad you like it Play Create Explore, thanks for stopping by! I printed these last week, used them this week. The kids LOVE them. I printed them scaled 2 pages to one sheet of cardstock so the kids traded them …” try this one” . . . as they enjoyed working with clay. That’s great Fran! I’m so glad your students enjoyed the cards, thanks for letting me know!